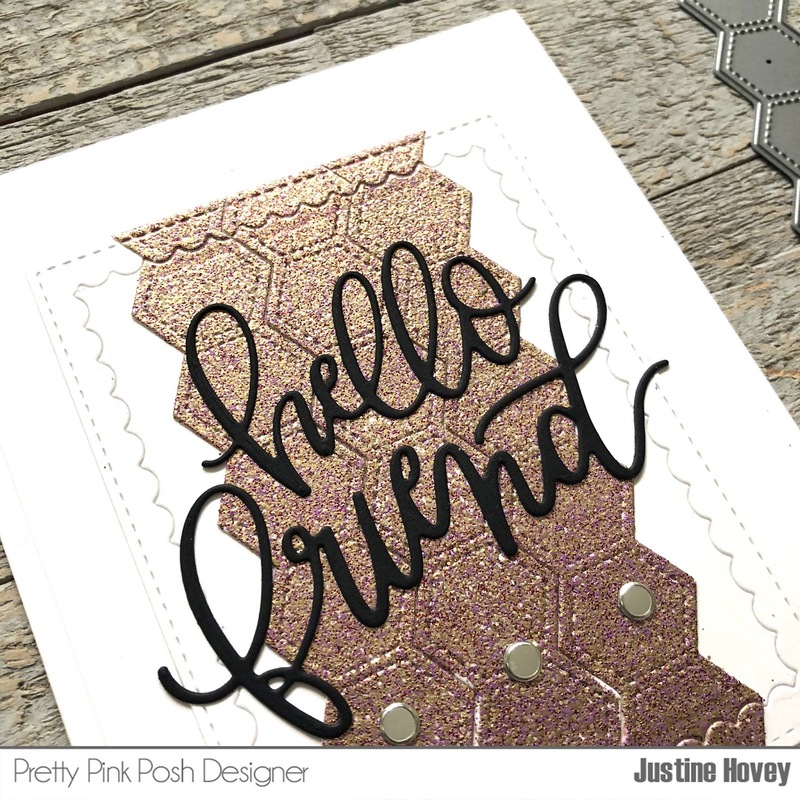 Justine's Cardmaking: Pretty Pink Posh & Wow Collaboration! Pretty Pink Posh & Wow Collaboration! A very big crafty hello and welcome to our very special blog hop collaboration with Pretty Pink Posh &WOW! Embossing Powder! I am currently sitting in London Heathrow typing this blog post and I'm excited for it to go live! For today's collaboration with WOW! Embossing Powders and Pretty Pink Posh, I decided to use some die cuts and emboss them with Turkish Nights embossing powder. It's not something I do super often but it created this beautiful background. It was a happy accident that my hexagons didn't fit the card panel I had originally cut and I had the chance to pull out one of my favourite dies - Scallop Frames to save the day! I topped off this card with the Hello Friend sentiment cut in black cardstock. Your card is so pretty. I love the coppery embossing. Really interesting background in your card! Thank you for sharing. Cool idea. Love this design. That is some very pretty embossing powder; gorgeous! Definitely unique! I would like to see more of this same idea. Thanks. Such a striking card, Justine! So nice to see all the amazing designs you gals come up with for these hops! Great card. Love the way you adapted and die cut the background. oooooh...such a pretty color of embossing powder! Thanks for the masculine card idea. I love the card Justine! WOW is my favorite embossing powder. I will have to get some new ones including the beautiful one you used. Thanks for the inspiration. Fabulous card design! I love the contrast of the scalloped border and cursive letters against the graphic hexagons. Fantastic texture and shine. What a fantastic card. I love the geometric feel of it softened by the cursive writing of the words. YOU so ROCK!! This is amazing! Beautiful, Justine! Your happy accident turned out to be totally fabulous! GREAT CARD! I really like the Turkish Nights embossing powder! Very pretty on the card! Love it when those mistakes turn out for the better!I call them floportunities! That background is so creative! What a fun technique, love the colors too! Your card is stunning and I am in love with the WOW! Turkish Nights Embossing Powder, it is gorgeous and yep it just went into my WOW! shopping cart lol. Wow!!! Awesome background and layout!!! So elegant, sparkly and gorgeous - love it! Thanks for sharing and inspiring! Love your embossing work! Thanks for the inspiration. What a reminder not to forget the background elements! And I own the PPP borders too! Very cool card. Love the embossing powder you have used! Simple yet makes a statement. This would be a good masculine card. Very Striking. Love the subtle hexagon shapes. The embossing cplor is lovely. Pretty idea. I love your pretty card! The stacked hexagons look so pretty, almost like metal or leather! it's a very unique look! That embossing powder is WOW.... Love the color and the shapes are perfect. Going to pin this!! Pretty card! Love the embossed shapes! Enjoying this collaboration hop and seeing all the projects along the hop! Beautiful card! Love the Embossing powder!!! Gorgeous! What a unique color! Love your amazing card and the color of the embossing powder. Wow, gorgeous Wow Embossing powder. Love the Hexagon die. Justine I love your card and I love love love the look of Turkish Nights embossing powder! It looks fabulous as your background. Going to try this. What a beautiful color of embossing powder. I will have to consider picking this up! Love how you used the die cuts for this card. The Turkish Nights embossing powder is gorgeous! In the close-up, it looks as if it has some purple highlights. Great design on your card with the hexagon strips. It's very creative! What a great thing it is when what looks like a mistake turns out wonderfully. Love this embossed panel of hexagons! Turkish nights is beautiful embossing powder color!. Love the embossed panel. Wow! Embossing with the Turkish Nights embossing powders on the die cuts really added such a gorgeous color and texture to everything!!! 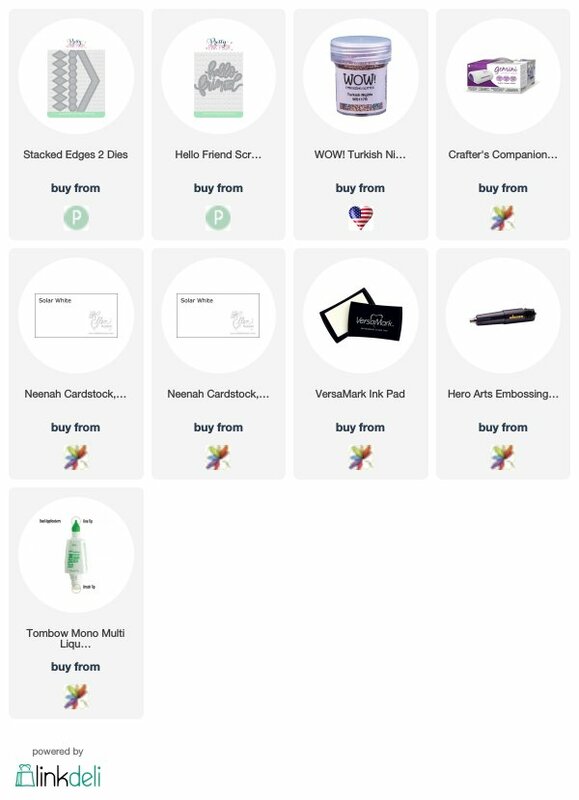 Am loving this blog hop just to see so many fabulous samples using these products!!! It is teaching me so much! It is making me want everything and want to play, play, play!! Enjoy your travels and can't wait to see more when you get back!!! That embossing powder is gorgeous! I love this bold, but CAS design! Great rich colour, loads of texture & shimmer, gorgeous clean crisp card. Great glitz and glam on this card. That’s such a cool card design ! And that powder gives such a great texture ! From here, it looks like leather or something. Very clever with the embossed die cut. I love the background effect!